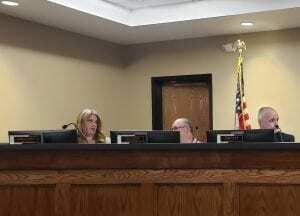 JASPER, Ga.- The Pickens County Board of Education held a board meeting on Thursday, March 14, 2019, to discuss Superintendent Reports as well as Action Items. Katherine White, Steve Smith, and Tony Young of the Pickens BoE. Chief Financial Officer Amy Smith was the first to discuss the financial update, citing that the FY19 (Fiscal Year 2019) General Fund revenue collected through February 2019 was 71.06 percent and expenditures were 55.38 percent of the approved budget. SPLOST (Special-Purpose Local-Option Sales Tax) revenue for February 2019 was $433,261.41, and interest earned was $3,250.07. Expenditures totaled $104,850.46 and the month-end SPLOST balance was $8,891,669.06. The school system, Smith went on, is reported to have no debt at this time. Assistant Superintendent Tony Young then delivered the report on the condition of attendance and dropout statistics for the month of February 2019. Cory Thompson of Jasper Middle School has the highest monthly average daily attendance at 95.27 percent, according to Young. One student was withdrawn this month, bringing the total this year to 11 dropped students. Dr. Carlton Wilson, Tucker Green, Phil Landrum III, Sue Finley, and Joeta Youngblood of the Pickens BoE. RESA (Regional Educational Service Agency) for the Technician district competition and a chance to compete in June 2019 for the state competition. There is also extensive Versa Trans Training taking place at this time. As far as Maintenance goes, the Board has been busy preparing for their Department of Education Facilities Review team visit, but everything is reported as going well with maintenance at this point in time. The National School Breakfast Week (NSBW) challenge that took place last week, sponsored by the Atlanta Community Food Bank, was reported to have been a huge success among the schools. It was a week of entertainment, prizes, and breakfast foods that are popular among the students. Food Services for the school system have been doing well lately in general. Monday, a record number of students were served breakfast, 1,372 total. Tuesday through Thursday of the same week, that number was improved upon to increase the total number of students served. On Friday, there were a total of 1,706. The district witnessed a 46.3 percent increase, with an average of approximately 500 more meals a day than the previous week. Tate Elementary came in with the highest Average Daily Participation percentage at 61 percent for the week. Pickens Junior High witnessed the greatest increase in breakfasts served, as they served an additional 165 more student breakfasts per day than the previous week, thus winning them $1,000 from the Atlanta Community Food Bank Breakfast Challenge. Upon request of Superintendent Dr. Carlton Wilson, approval of all four Personnel Action Reports passed without further discussion or opposition. These reports are recommendations by the administration to employ the individuals listed in each report, with such employment being contingent upon release from any previously signed contract and a successful background check. Employment is temporary until said contingencies are met. The reports may be viewed in full here: Personnel Action Report Number One, Personnel Action Report Number Two, Personnel Action Report Number Three, and Personnel Action Report Number Four. Dr. Wilson went on to recommend the approval of School Bus purchases by The Operations & Transportation Departments for the FY20 school year. The order is for a total of five 72-Passenger Buses, with a unit cost of $98,881.00 and total cost of $494,405.00, as well as one 48-Passenger Bus with Wheelchair Lift at a cost of $108,556.00. The total $602,961.00 is based on state contract, and SPLOST funds are said to cover the expenses. This move will also see to it that each route bus will be air conditioned. This recommendation was approved without further discussion or opposition. The Five-Year Local Facilities Plan passed without further discussion or opposition as well. This plan is a requirement by the Department of Education Facilities Unit to show the district’s need when it comes to facilities. This new plan displays a total $10,408,162 of eligible needs for earning State Entitlement funding. There was also a total $12,917,312 of documented needs that were considered ineligible costs for entitlement earnings, and which were decided to be a local district responsibility. A Georgia Department of Education Facilities Survey Team consisting of area facilities administrators made a visit to the district on Tuesday, March 12, 2019, and thus the plan was evaluated and validated at that time. The board also approved the Guaranteed Maximum Price (GMP) of $3,999,458.00 from Carroll Daniel Construction for the purpose of Phase One of the Pickens Junior High renovation project. The school system earned $802,138.00 of entitlement from the State Department of Education for the project. Pickens County School System is responsible for $3,197,320.00 that is to come from SPLOST funding, which will be a savings from the original price of $454,800.00. In the last order of business for the Action Items during the meeting, Chairman of the Board Tucker Green was elected as Voting Delegate for the 2019 GSBA (Georgia School Board Association) Summer Conference & Delegate Assembly in Savannah, GA, with Chairman of the Board Steve Smith elected as an Alternate.